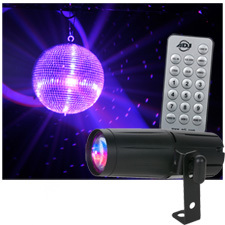 The ADJ Pinspot LED Quad DMX is a 8-Watt Quad Color (4-IN-1) Pinspot with red, green, blue and white diodes on one LED. It produces sharp 15-degree beams on light, and is designed to spot tables, decor, architecture or used for special effects. 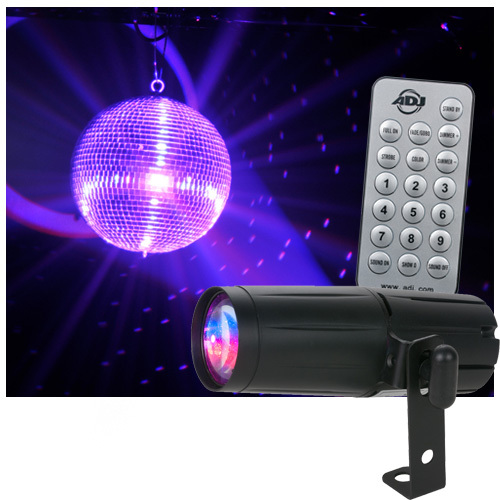 The Pinspot LED Quad DMX comes with a wireless ADJ UC IR remote to control color fades, built-in shows, dimming, strobe, black out and sound activation. DMX connections allow users to connect and control multiple units at the same time from a DMX software or hardware controller . The Pinspot LED Quad comes with a wireless IR remote to control color fades, built-in shows, dimming, strobe, black out and sound activation. • Weight: 1 lbs. / 0.5 kg.